What is like going to court? It is life or death; afterwhich, a victim commits suicide or lives. In both cases ours souls are ripped apart. If you don’t walk in love you walk in death – there is no in between. 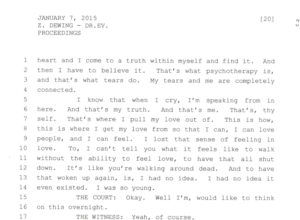 On January 7, 2015, Page 20; transcript of my closing argument was rooted in love; it was everything that I had learned from God.